F&W’s Jen Murphy goes off the grid to get a look at the future of eco-travel: tiny, quirky, local-minded lodges that offer memorable farm-to-table dinners and a little hedonism, too. Five years ago, I first heard whispers about Bocas del Toro, an archipelago in northwest Panama, while staying at an eco-lodge in Costa Rica that served little more than rice, beans and fried plantains. Apparently, I’d just missed undiscovered Costa Rica, but Bocas supposedly still had deserted white beaches. That’s how I find myself off the coast of Panama on a small boat, the only viable form of transportation from Bocas Town, on Isla Colón, to the La Loma Jungle Lodge on Isla Bastimentos. La Loma is part of a new wave of tiny eco-lodges in relatively untouched parts of Latin America that are not only built with sustainable materials, but also give back to local communities by doing things like teaching farmers about crop rotation. 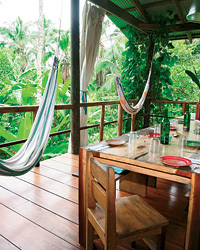 These resorts are so eco-friendly in part because they are so small: La Loma, for example, has just three cabins. Piloting the boat is Henry Escudero, an expat who owns La Loma with his partner, Margaret Ann. A Peruvian-born archaeologist who grew up in Los Angeles, Escudero talks about the area with a scholar’s authority and a history geek’s enthusiasm. He excitedly points out a breaching bottlenose dolphin to our right and notes that we are crossing the Changuinola canal, an inland waterway built in 1898 and later purchased by the United Fruit Company (now Chiquita Brands International), which for years mercilessly controlled much of the Panamanian economy. As a Ngobe family paddles near our boat in a wooden cayuco—a dugout canoe—Escudero gives a brief disquisition on the local indigenous tribe. About 40 Ngobe families live around the waterways, he tells me, and with the sun rapidly sinking, I start to worry about how we’ll be able to avoid a cayuco collision. Just then, Escudero kills the engine and steers our boat into a nearby mangrove swamp. All I can think is that we must be stopping to give a local employee a lift to the lodge. But no, this rickety dock is the entrance to La Loma. When Escudero and Ann moved to Panama, they purchased locally owned land. 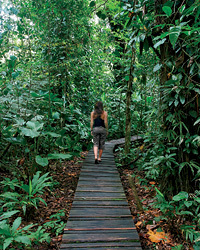 The previous owner had planted 12 of the 57 acres with cacao, coconut and banana groves, which the couple have restored. He had also cleared a hill to plant corn but later abandoned the plan, allowing the couple to build the main lodge and three cabins there without having to rip out any old-growth vegetation. Escudero and Ann spent nearly a year sourcing the sustainably harvested lumber used to build the cabins, most of it from naturally fallen trees in the area. Ann bought as many locally produced furnishings as possible instead of importing container-loads from the United States, as many other expat-owned hotels do. My cabin is nestled in the trees at the top of the hill, and even my years of living in walk-up apartments hasn’t quite conditioned me for the Machu Picchu–like climb to reach it. I count 202 steps leading to my door. The furnishings are simple—the vines falling into the room are adornment enough—but the most important items are chosen with care: a good mattress (protected by mosquito netting, essential in this area), hot water (supplied by solar power) and a “survival box” filled with citronella candles and naturally bug-repelling incense. I’m roughing it in a sense, but Escudero and Ann know how to strike that fine balance between luxurious necessities and environmentally friendly practices. For instance, instead of the rice-and-bean meals common at many Latin American eco-lodges, the pair serve more ambitious dishes using ingredients they either grow themselves or source locally. On my first night, Escudero plays bartender and urges me to try Panama’s national drink, milk and seco (an alcohol triple-distilled from sugarcane). I force myself to take a polite second sip before he confesses, “Everyone tries it, but no one ever drinks it.” I exchange it for a Golden Rum Punch—a kind of island-style gin-and-tonic mixed with lemon juice, tonic, brown sugar, cucumbers and a sprinkle of nutmeg. Dinner, served by candlelight at a long communal table in the main lodge, begins with chunky, lightly fried cassava chips that we dip into a fiery aioli made from chombo chiles grown in La Loma’s gardens. Local lobster and conch are not sustainably harvested, Ann says, so instead La Loma buys seafood caught nearby on short lines, like tonight’s grilled yellow jack, a moist, flaky fish served with passion-fruit pico de gallo, coconut rice and crispy fried katuk, a spinach-like tropical green. The next day, I spend a few hours helping Ngobe women grind cacao pods into an intense liquor that Escudero will use for baking desserts. He and Ann knew nothing about growing cacao before arriving in Panama, but by reaching out to locals and experts like chef and cookbook author Maricel Presilla, they restored the property’s original cacao groves and now harvest their own pods. Escudero is also trying to set up a community cacao co-op to sell directly to specialist chocolatiers, like Sir Hans Sloane of London. All of La Loma’s employees are locals, including Anasario “Chapi” Piñeda, who takes me on an all-day hike the next day. After we walk through a village where women are cooking lunch, he shows me a native fern that leaves a tattoo-like faint white print when pressed against the skin. We end up at a cave, where we put on headlamps and wade though murky water to see stalactites and stalagmites, as well as an albino bat sleeping in a crevice in the back. I had cavalierly refused to put on mud boots back at the lodge and am now covered knee-deep in muck, but the mess is worth it. The next day we go on another hike, this one a strenuous eight-mile trek across the jungle interior to the pristine white-sand beaches on the other side of the island. Chapi slices a path through the dense vines with his machete while pointing out camouflaged creatures that my untrained eyes would never have seen—a rare two-toed sloth, crocodile-like caimans, the thumb-size strawberry poison dart frog. As we walk, he tells me about his many siblings and his oldest son, who is the first of his three kids to attend college in one of Panama’s biggest cities, and his wife, “a good, sturdy woman” who makes delicious seafood stews but “gets mad when I talk to other ladies.” When we finally reach one of the most gorgeously wild stretches of beach I’ve ever seen, he pulls two coconuts from a tree and chops off the tops, and we reward ourselves with the fresh coconut water. For dinner that evening, Ann has prepared a recipe she learned from Chapi’s mother called Bastimentos rondon, a luscious fish stew with coconut milk and chunks of taro-like dasheen and ñame, varieties of African yams. The lodge carries a selection of wines from the respected Chilean producer Viña Morandé, and Escudero pours me a glass of a nicely balanced, fruit-forward Carmenère. The dinner conversation veers from the environment to the upcoming U.S. presidential election to a vote on which muffins guests prefer at breakfast (Ann’s chocolate-coconut wins handily over Escudero’s apple-banana). Remembering that I still have to hike to my room by the light of my headlamp, I decline another glass of wine and instead ask for a mug of rich coffee from the nearby Bahia Honda organic coffee farm. That night, amid the chirps and rustling of jungle creatures (probably the armadillo that likes to hang out under the cabanas, Escudero later assures me), I can make out the thumping beat of music from the bars miles across the water in Bocas Town—a reminder of everything Escudero and Ann hope to keep away from their jungle home.